Mike Pence (R., Ind.) says he is seriously weighing a run for the White House, but many signs point to him running for Indiana governor in 2012. When conservative activist and former presidential candidate Gary Bauer scans the potential 2012 Republican field, not much excites him. "All the obvious frontline names have all the usual pluses and minuses," Mr. Bauer says. But in considering one candidate, Mr. Bauer sees only qualities that he likes. 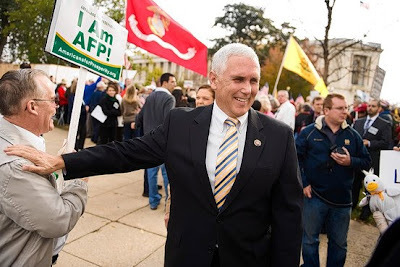 Indiana Rep. Mike Pence is a military and fiscal hawk who frequently plugs his Christian credentials. To some, he's the potential candidate best able to unite two wings of the Republican Party—its fiscal conservatives and social conservatives. Now, Mr. Pence has a decision to make: While he says he is seriously weighing a run for the White House, many signs point to him running for Indiana governor in 2012 instead. Bullock: Growing population disparity between the northern part of state & south will translate into significant changes in how “the Two Georgias." One of the state’s most renowned political scientists said south Georgia is poised to lose more representation as the state reorganizes political districts in the wake of the latest census figures. While Georgia itself picked up one new seat in the U.S. House of Representatives thanks to an increase in population, the epicenter of the growth in Georgia continues to be in northern Georgia, which University of Georgia professor Charles Bullock expects to see Georgia’s newest congressional district emerge. Meanwhile, in south Georgia — everything below the “gnat line” as Bullock says — growth is slower, or, in some cases, stagnant or even declining as people move from their hometowns out-of-state or to larger urban centers looking for work or higher education. This growing population disparity between the northern part of the state and the south will translate into significant changes in how “the Two Georgias” are governed both at the state and federal levels when the General Assembly takes up the redistricting process in the second half of 2011, Bullock said. In terms of south Georgia, the three main congressional districts — the 1st, 2nd and 8th — will most likely be impacted by the population shifts. Under federal guidelines, law and caselaw handed down by the U.S. Supreme Court, when the General Assembly tackles redistricting it must take into consideration certain factors. Additionally, Georgia must have its districts approved by the U.S. Department of Justice prior to their taking shape when the 113th Congress takes its seat in 2013, to ensure that minority districts are fairly represented both at the federal and state levels. While the U.S. Census has until April 1 to get the local census data to the General Assembly for use in redistricting, based on the three above guidelines and Georgia’s population trends that have already been announced, Bullock said he believes the three main south Georgia Congressional districts will likely undergo changes before they can be approved. Since the 2010 Census data show that Georgia’s population grew by 18 percent between 2000 and 2010 to better than 9.6 million residents, and each district has to be close to the same number of residents, changes in population density in the south will likely mean all three districts will have to pick up some real estate to keep the 680,000-people-per-district ratio close, Bullock said. “Since the population will presumably be more dense in northern Georgia, the southern districts will have to find more people to equal out,” Bullock said. “That could make for some interesting drawing given that the 2nd is landlocked by Alabama and Florida, and the 1st is locked in by Florida and the Atlantic. “What I expect you’ll see is that the Republican leadership will concede the 2nd to Sanford Bishop and draw the 8th to make it safer for newly minted congressman Austin Scott,” he added. Bullock said he doesn’t expect the 2nd congressional district to change much geographically, but it will likely be redrawn to pick up the rest of Muscogee County in the north. When it comes to the state House districts, Bullock admits race becomes more of a factor when redrawing the lines. In Albany, which includes primarily two districts whose residents are predominately black, Bullock doesn’t foresee many changes in the shape of the districts unless the population within Albany and Dougherty County stayed stagnant. “In the 150th and the 151st, they likely won’t change much unless there either was very little growth or a decline in population,” Bullock said. “In that case, they may have to go further east in the county and take the real estate that currently belongs to the 152nd. “The Justice Department won’t like it, but they could justify it,” he added. In that instance, residents of eastern Dougherty County would lose representation they have under Rep. Ed Rynders, R-Leesburg, and likely pick it up from Rep. Carol Fullerton, D-Albany. Broadening the picture, the future isn’t very good for the southern part of the state in terms of state representatives. South Georgia is poised to lose at least two Senate seats and at least six house seats to north Georgia because of the disparity in population, which will increase the influence metro Atlanta and northern Georgia representatives have on policy. That means that hot-button issues such as water rights and state funding could be resolved to the benefit of northern constituents regardless of the displeasure of those in the south. Even more concerning is the shift in party politics, Bullock said, as more Republicans are elected and more Democrats defect — Rep. Mike Cheokas of Americus switched to the Republican party just this month — the closer they get to obtaining the 2/3 super majority needed to rail through amendments to the state constitution. Still, Bullock said that it’s unlikely Atlanta will work with reckless abandoned against the concerns of the south. Georgia's 13 U.S. House of Representatives members are home and the 111th Congress is complete. 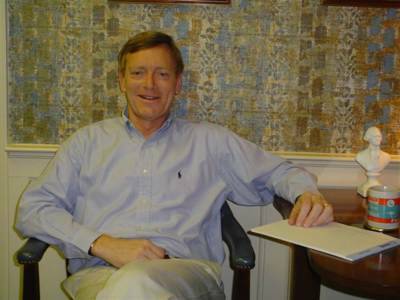 For Democratic Rep. Jim Marshall of Macon, so is his political career -- for now. Marshall was the only incumbent Georgia congressmen voted out of office, making him the state's only congressional victim of the anti-Democratic sentiment that swept the country and flipped control of the House from Democrat to Republican. As he prepared to leave the job he's held for eight years, Marshall said he was not bitter or overly disappointed. In a recent interview, he actually seemed surprisingly upbeat. "There's a lot of things I'll miss about this job, but I'm not ... pining away to stay here," Marshall said in the hallways of the Cannon House office building. He had a fifth-floor office there until he and other outgoing members were unceremoniously moved out in early December to make way for incoming freshman lawmakers. "At some point, it was going to end," said Marshall, 62. "And this is ending at a time in my life when I can easily move into something else that will be productive and fulfilling. "I'm looking forward to that, actually." It's a little surprising Marshall lasted as long as he did as the representative of Georgia's 8th Congressional District. A transplanted northerner, he is reserved and soft-spoken to a point that some suggested he was arrogant and out of touch. "He's never been a good ol' boy, and the Democratic base in this district is a good ol' boy base," said Chris Grant, Mercer University political science professor. Marshall has rarely had anything but a close race, always forced to walk a precarious tightrope as a Democrat in a conservative district in the middle of a Republican state. As Georgia turned increasingly Republican, his fight for survival as a Democrat turned increasingly tougher, even if he was one of the more conservative Democrats in Congress. "He had been squeaking by," Grant said. "He'd been able to swing some Republicans for a long time, but I think in 2010 Republicans weren't interest in voting for Democrats of any sort." Added Republican Rep. Lynn Westmoreland of Coweta County, who managed recruitment efforts for the National Republican Congressional Committee: "He got caught in a wave. We've been through three wave elections in a row now. I think Marshall benefited from the first two, and he got caught by the third." Marshall said he doesn't regret how he ran his race against Republican Austin Scott of Tifton. The 41-year-old former state representative beat Marshall by 10,500 votes by portraying the incumbent as a close ally of House Speaker Nancy Pelosi, which Marshall is not. Marshall paid little attention to Scott until the waning weeks of the election, and then was forced to scramble to defend himself and his record. Marshall said also he doesn't regret remaining a Democrat in a state where party switching is common, even though he regularly voted with Republicans during his time in Congress. Asked if he could've won re-election if he switched parties, Marshall said, "certainly that's true." It would have been an easy move for Marshall to make. Most of his family is Republican, he said, and while he leans liberal on social causes, he is conservative when it comes to fiscal issues, defense and other areas. His connection to the Democratic Party runs deep, though, reaching back to his teenage years, when Marshall's family moved to Mobile, Ala., in the 1960s. "I had never actually seen race discrimination and I've never seen the depths of poverty that black folks there were suffering from," Marshall recalled. "I just thought Republicans were on the wrong side of that issue back then." Of Georgia's congressional delegation, perhaps no one is more suited to find a new job than Marshall, given his lifetime of changes. Prior to representing the 21 counties stretching from rural southern Georgia to the suburbs south of Atlanta in Congress, Marshall was the mayor of Macon. He is no lifelong politician, however. He was a U.S. Army Airborne Ranger in Vietnam, a university law school professor in Macon and also has worked as a welder, hunting guide, logger, short-order cook and mechanic. He was educated at Princeton and at Boston University, but he's as comfortable at a south Georgia barbecue as he is in a banquet room full of academics. "I've done lots of things in my life; I've gone through lots of transitions," he said. His next transition will likely mark a return to his past. Marshall said he's been offered a teaching position at the Woodrow Wilson School of Public & International Affairs at his alma mater, Princeton -- a place where many ex-politicians have landed over the years. The timing is good: Marshall's daughter graduated from the school last year and his son is a sophomore there. "I've talked about doing this for a while," said Marshall, who taught law at Mercer University for nearly 20 years before running for Congress in 2002. "The president [of the school] told me, "Geez, it would great because unlike some of the others we get, you have experience as a university professor; you know how to do this," Marshall said. But Marshall also knows politics, something he doesn't rule out returning to as well. "I don't preclude it," he said, "but I don't have plans to do it either." In the second year of Ronald Reagan's presidency, the magazine Conservative Digest devoted an entire edition to portraying him as a man who had turned his back on conservative principles. In his private diary, Mr. Reagan noted that the magazine labeled him a "turncoat" and said conservative activist Richard Viguerie sent him a copy of the magazine along with a letter. "He tried to write in sorrow, not anger about my betrayal of the conservative cause," the president noted with a tinge of sarcasm. "He used crocodile tears for ink." To put it mildly, President Reagan—now considered a hero on the right—survived that criticism from his own supporters. That lesson might hearten President Barack Obama today as he is lacerated by liberals of his own party even as he enjoys his first real set of bipartisan legislative successes during Congress's current lame-duck session. President Reagan's apostasy then, as is Mr. Obama's now, was to compromise with the opposition party on taxes, among the most ideologically charged of subjects. Mr. Reagan saw little choice but to do a tax deal to win concessions on other important items. He conceded not so much to Democrats as to political reality—which is pretty much what Mr. Obama did in his deal with Republicans to extend tax cuts in return for more unemployment benefits and a new economic-stimulus bill by another name. As those experiences show, it's nice for a president to have a dedicated base of ideological followers—and it's also troublesome for a president to have a dedicated base of ideological followers. Those followers often expect the president to be the leader of them, not of the country. In that sense, the most important movement Mr. Obama has made since the midterm election hasn't been toward the ideological center, or toward Republicans. It has been to move toward his own independence—or, more precisely, back toward his own independence. The Barack Obama elected in 2008 presented himself as a kind of singular force, neither party man nor ideological figure but—in the campaign cliche—a postpartisan leader. Yes, he was probably more instinctively liberal than, say, Bill Clinton, but ideology wasn't the point. Making Washington work was the point. David Axelrod, the president's political counselor, says the Obama candidacy actually was predicated on this pledge to "get past hyperpartisanship," adding: "It was that more than any particular issue that animated public support." The problem with the president's first two years in office was that he often came to be seen as a traditional, off-the rack Democrat, at once more liberal and more partisan than many voters assumed. He appeared less focused on finding common ground than in keeping his House Democratic caucus together and in winning that elusive 60th Senate vote always needed to break a filibuster. Along the way, the least popular of national Democratic figures, House Speaker Nancy Pelosi, frequently was seen as the driver of Democratic strategy, rather than the postpartisan president who so appealed to independent voters not so very long ago. In some cases, Mr. Obama had little choice in this approach. A president with a congressional majority is expected to use it, and an opposition party with no political control in Congress has no responsibility and therefore little incentive to give ground. Which is why losing control of the House in November may not have been the worst thing for Mr. Obama. Even before the new Congress was seated, the Capitol's dynamics changed in this month's lame-duck session. Unable to count on a House majority, Mr. Obama was no longer obliged to defer to that majority. Republicans, no longer able to avoid it, accepted responsibility for a deal on taxes. It's particularly instructive how Mr. Obama's tactics in the recent tax debate differed so conspicuously from those he pursued in the long and politically troublesome health-care discussion. In the health debate, Mr. Obama never actually presented his own health plan, but, rather, waited for congressional Democrats to settle on one. Even as Republicans excoriated "Obama's health bill," there was no Obama health bill, only variations drawn by congressional Democrats. This time, there was an Obama tax bill. Mr. Obama now will be accused of being more concerned with his own re-election than with the fate of his party. There also are questions about why, having given ground on taxes, he didn't get more assurances of Republican support on ratification of the new strategic arms agreement with Russia, which hangs by a thread in the Senate. And Mr. Obama will need his liberal friends in the battles of the next two years, as they will need him. But for now he's won some victories and reclaimed a measure of his own independence. These Friday photos, sadly, say it all. 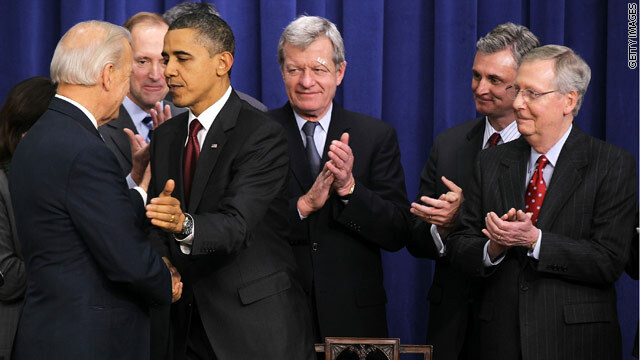 Democratic no-shows as interesting as attendees at Obama tax signing. President Obama owns the Afghanistan war, and now he owns the tax bill. 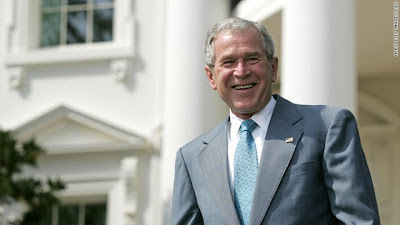 President George W. Bush must be smiling as his policies remain in place. Immigrants fanned out across the United States in the last decade, settling in greater numbers in small towns and suburbs rather than in the cities where they typically moved when they first came to this country, new census data show. In Los Angeles County, long a major destination for new immigrants, the foreign-born population remained largely unchanged for the first time in several decades. In contrast, it quadrupled in Newton County, in central Georgia outside Atlanta. I just switched from Google to rival search engine Microsoft's Bing. Will I stay with Bing? Time will tell. If search results are all about relevance, Google could be risking its own. In local search, for instance, by promoting its own results over other, perhaps more relevant sites, as suggested by a Journal report Monday, Google may be doing users a disservice. It also may be giving rivals like Microsoft a chance to take share. Arbitrating website relevance for searchers, as Google does, is a tall order. Results that one web surfer finds informative may be useless to another. Google's two-thirds share of searches, according to comScore, suggests it has managed well, historically. Yet Google's investment in its own content has to conflict with its role as a neutral arbiter. Google says its search results are engineered for users. And admittedly, some publisher complaints about their Google rankings are little more than sour grapes. Some sites that are original and relevant appear to be suffering because Google has designs on their traffic. Yelp.com is a good example. Google views local search as strategic and is investing heavily to make its local results better. With its vast array of user reviews, however, Yelp offers some of the best local content available. Indeed, Google tried to buy the company last year. But in the latest version of its local results, Google appears to be downplaying Yelp web pages in favor of its own results that aren't as relevant. The risk is that searchers bypass Google as a result. This could provide an opening for rival search engines, particularly Microsoft's Bing. Since its integration with Yahoo's site, Bing already is a more vibrant rival. With a combined 28% of search queries, it remains a distant second. That can only change if Google forgets its priority is its users. Fareed Zakaria tells it like it is: Procrastination economics; somehow, it's never time in Washington to cut spending or raise taxes. This is the wrong time to raise taxes, say the politicians. The economy is fragile, say the economists. The recovery is halting, say the pundits. In a few years, they all affirm, we will need to get our fiscal house in order. Of course, just a few years ago, the economy was doing fine, and Washington decided it wasn't the moment to worry about the deficit. Instead, over the past decade, we cut taxes, added a massive entitlement program (prescription drugs for the elderly) and spent trillions on two wars. Somehow, no matter what the economic clock says, it's never time in Washington to cut spending or raise taxes. Call it manana economics. The best one can say about President Obama's compromise plan with Congress is that it will do some short-term good - at long-term cost. The only parts of the plan likely to have a significant effect in stimulating the economy are the extensions of unemployment insurance, cuts in payroll taxes and, perhaps, tax credits for businesses ("perhaps" because they are temporary and thus would only bring forward investments). To get these measures, worth about $250 billion, Obama agreed to an extension of the Bush tax cuts that will cost around $750 billion, and eventually much more since the tax cuts are now more likely to become permanent. It makes the original stimulus plan of 2008 look stunningly efficient. Rose Mary Woods, President Richard M. Nixon's personal secretary, demonstrating in 1973 how she might have accidentally erased parts of the president's tapes. 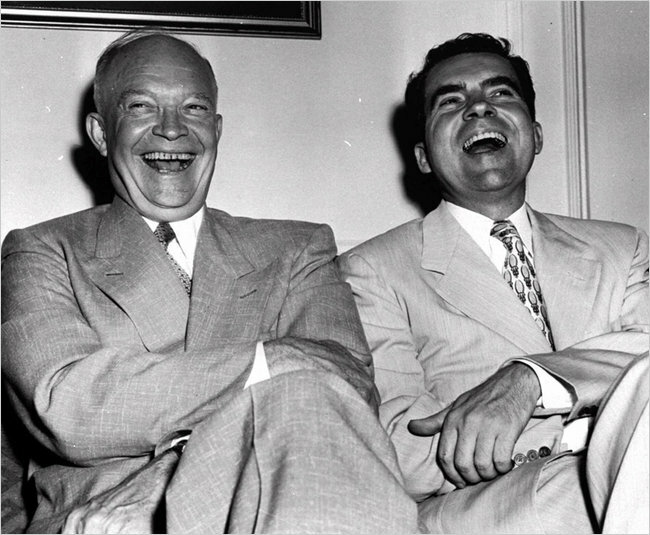 Gen. Dwight Eisenhower and his vice-presidential running mate, Senator Richard Nixon, in 1952. Richard M. Nixon made disparaging remarks about Jews, blacks, Italian-Americans and Irish-Americans in a series of extended conversations with top aides and his personal secretary, recorded in the Oval Office 16 months before he resigned as president. Nixon continued: “The Italians, of course, those people course don’t have their heads screwed on tight. They are wonderful people, but,” and his voice trailed off. 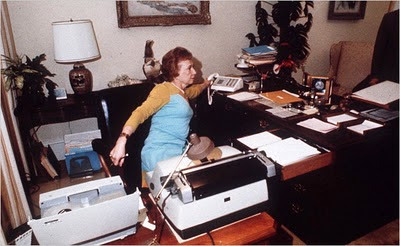 At another point, in a long and wandering conversation with Rose Mary Woods, his personal secretary, that veered from whom to invite to a state dinner to whether Ms. Woods should get her hair done, Nixon offered sharp skepticism at the views of William P. Rogers, his secretary of state, about the future of black Africans. “Bill Rogers has got — to his credit it’s a decent feeling — but somewhat sort of a blind spot on the black thing because he’s been in New York,” Nixon said. “He says well, ‘They are coming along, and that after all they are going to strengthen our country in the end because they are strong physically and some of them are smart.’ So forth and so on. These tapes, made in February and March 1973, reflect a critical period in Nixon’s presidency — the final months before it was “devoured by Watergate,” said Timothy Naftali, the executive director of the Nixon Library. 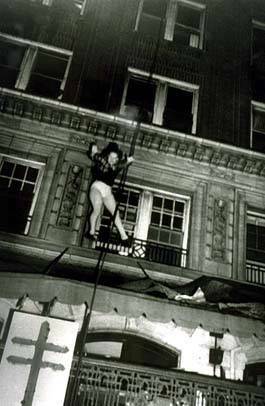 Mr. Naftali said that there were now only 400 hours of tapes left to released, and that those would cover the final months before the tape system was shut down in July 1973 after Alexander Butterfield, who was a deputy assistant to Nixon, confirmed its existence to the Watergate committee. President Obama is getting along better than ever with Capitol Hill Republicans. But his relationship with Democratic Sen. Charles E. Schumer has hit a rough patch. The newly appointed Senate Democratic "message" guru has emerged as the White House's chief antagonist over the tax cut deal Obama worked out with GOP leaders. To Schumer (N.Y.), Obama's decision to accept a two-year extension of all the tax cuts enacted by President George W. Bush - even at the highest income levels - is a needless capitulation to resurgent Republicans. Schumer wanted the president to push harder to extend the tax cuts, set to expire at year's end, only for middle-class families. But to the White House, it is Schumer who is acting recklessly by seeking to wage class warfare with just days left on the legislative calendar, risking the health of the economy and the pocketbook of every middle-class household with his threat to carry the fight into next year. The contentious, mostly private standoff has turned Schumer into an unlikely villain among administration officials who have long valued his tactical skills and political acumen. It has also made him an unlikely champion to liberal activists who are seething at the Obama deal. In an appeal this week to supporters, the liberal group Moveon.org praised Schumer, a long-time ally of Wall Street, as one of their "progressive heroes" and saying "we need you now." Obama views the fate of the Bush breaks as chiefly an economic question, and to him, the answer is clear: The sputtering recovery can't withstand any tax increases. The White House also hopes cutting a deal with Republicans will help to clear away some GOP opposition to additional stimulus spending the president wants to enact and to the ratification of the New START nuclear arms treaty with Russia. Schumer took a different view. Middle-class independent voters abandoned Democrats in droves last month, and Schumer, who just won a third term, wanted to portray the GOP as the party of millionaires and billionaires. "Our colleagues on the other side of the aisle said, 'Did you hear the mandate of the election?' " Schumer told reporters last week. "Well, I ran this year, I got 66 percent of the vote in my state. And I saw lots of people and lots of angry people. . . . But not a single one of them, from the tea party or anywhere else, said give tax breaks to the millionaires." For the White House, vindication arrived Saturday, when Democrats failed to pass two measures that would have allowed the Bush tax breaks to expire on top earnings. One provision, Obama's original preference, would have preserved all the Bush tax cuts on household income below $250,000 per year. A second measure, offered by Schumer, sought to preserve cuts on household income below $1 million per year. "His advice was to fight until February and then cut a deal, so we could score some points against the Republicans," said a senior administration official, speaking on background. "It just didn't make sense." Schumer declined to address the feud. "No comment," he said Thursday. Many Democrats dislike the Obama-GOP deal, which in addition to extending all the Bush tax cuts would provide a generous exemption to the wealthy on the estate tax. The legislation, now pending on the Senate floor, also includes a one-year payroll tax holiday, generous business-investment incentives and continued jobless benefits for the long-term unemployed. But some Schumer colleagues said the party gave Obama little time or leverage to stage a tax fight with Republicans. House and Senate leaders, including Schumer, decided months ago to shelve the tax debate until after the election, and they failed to quickly rally behind a common strategy after Nov. 2. In the Senate, Democratic leaders went so far as to conduct a survey of 2010 candidates, senior aides said, determining that a majority of their candidates wanted to delay tax votes until the December lame-duck session. The aides requested anonymity to speak freely about private deliberations. "There was a point at which the leaders in Congress said to the White House, now it's yours," said Sen. Richard J. Durbin (D-Ill.), the No. 2 Senate Democrat, "And they've brought back something and now many members of Congress are saying, wait a minute, why'd you do that without us?" The first exchange between Obama and Schumer on taxes took place at the end of a Democratic leadership meeting held at the White House on Nov. 18. Schumer had appeared on "Face the Nation" the previous Sunday to float his $1 million compromise, and he urged Obama to consider the approach as the White House weighed how to proceed. On Nov. 22, Obama and Schumer met one-on-one to discuss taxes and other issues. Schumer urged the president to take on Republicans by refusing to accept a short-term extension of the entire Bush package. He also proposed that Obama spend December selling voters on tax increases for the wealthy, even suggesting that the president appear at events alongside local millionaires who were prepared to relinquish their tax breaks to help reduce federal deficits. Over Thanksgiving weekend, Schumer and other Democrats canvassed their caucus to gauge support for a standoff, even if it resulted in temporary tax increases for the middle class. Schumer was confident that middle-class voters would blame Republicans if the tax cuts expired without a deal and their federal withholding suddenly spiked in January. He found more than 40 Democrats who shared his view, more than enough to sustain a filibuster. A week later, Schumer and Senator Harry Reid (D-Nev.) returned to the White House. Obama and Vice President Biden raised doubts that Democrats could block a two-year extension and argued that a protracted battle could damage the recovery. Schumer told the president that he didn't think Republicans would grant him the unemployment benefits extension that Democrats had been seeking, because the White House had already signaled that it would support a two-year extension. The two senators met again the next day with Obama and Democratic House leaders, and learned of the emerging compromise with Republicans. Reid scheduled Saturday votes on the Democratic provisions to beat an announcement from the White House about its deal with the GOP. After both measures failed, Schumer and his allies decided it was time to change course. Now the focus is on next year, and separate bills to raise taxes on the wealthy as part of a broader deficit-reduction push. "This party should not be afraid of this debate," said Sen. Claire McCaskill (D-Mo. ), a Schumer ally who faces reelection in 2012. "The American people are on our side." Two bits, four bits, six bits, a dollar, all for adding to the deficit by $858 billion as proposed by our fearless and unfeared leader . . . The Senate unveiled final details of a broad tax bill—and its 10-year price tag of $858 billion—and began debate Thursday night on the package, a significant step after two years of gridlock over how to treat expiring tax cuts enacted under former President George W. Bush. Without action, income taxes on nearly every American are due to rise on Jan. 1. The Senate has moved quickly after Mr. Obama and Republican leaders unveiled the package Monday, with a key test vote now scheduled for Monday. Blake Aued reports in the Athens Banner-Herald that Jane Kidd will not run for a second term as state Democratic Party chair. Kidd, a former public relations professional who was elected to the volunteer position in 2007, said she needs a paying job that involves public service. "I'm looking at a lot of options," she said. "I don't have any specific plans right now." From the Cracker Squire Archives: When I next have to stay overnight in a hotel in Atlanta, it will be at what I will always call the Winecoff. 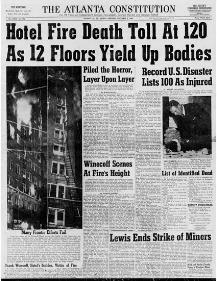 For Georgians, there will always be a second December 7 that lives in infamy, this one being the Winecoff Hotel fire that occurred on December 7, 1946. President Barack Obama reached agreement Monday with Republican leaders in Congress on a broad tax package that would extend the Bush-era income tax cuts for two years, reduce worker payroll taxes for one year and give more favorable treatment to business investments. Mr. Obama acknowledged that the agreement marked a significant reversal for him, as he has long argued that income tax cuts for couples earning more than $250,000 should expire. As part of the deal, the White House is proposing a provision to encourage more investment in plant and equipment, by letting companies claim deductions on 100% of most kinds of investment. For Mr. Obama, reaching a deal with the GOP on taxes could help him score points with moderates and independents, an increasingly important constituency, by underscoring his ability to work with newly empowered Republicans. The payroll-tax reduction under discussion now would cut the 6.2% Social Security tax levied on a worker's wages to 4.2%. A worker making $40,000 a year would save $800, and some economists say that could help stimulate demand at a time when the economy remains relatively weak. The employer's half of the tax—also 6.2%—wouldn't be affected under the White House proposal, and thus the cost of hiring new workers wouldn't be directly affected. The payroll tax reduction would take the place of a $400-per-worker income-tax break that Mr. Obama included in the 2009 stimulus bill. That break, known as Making Work Pay, provides a tax credit of 6.2% on the first $6,450 of a worker's wages. It phases out for workers making more than $75,000. Some Republicans prefer the payroll tax reduction to the Making Work Pay program because it goes to everyone who works, regardless of income. A senior administration official said that the payroll tax cut would cost $120 billion, twice that of Making Work Pay, and would give bigger benefits to some low-income workers. The proposed 2% rollback of individuals' payroll taxes used to fund Social Security is the latest iteration of an idea that's been kicked around for years as a way to supplement incomes and boost economic growth. Under the plan, the Social Security payroll tax on individual wages would be lowered to 4.2% in 2011, from the current 6.2% rate. A worker earning $70,000 would pocket $1,400 as a result of the tax cut. Social Security taxes apply only to the first $106,800 in wages, so the benefit for high earners tops out around $2,100. The employer share of Social Security taxes would not be affected. Obama administration officials say there would be no effect on Social Security benefits or long-term solvency. But the government would have to borrow to make up the lost revenue to the Social Security trust fund. The plan's detractors say it would undermine the program and likely become permanent. How much it would affect the economy is open to debate. The one-year cut would total $120 billion. Proponents of payroll tax cuts argue that they are effective stimulus because they can be delivered quickly. Also, because they are concentrated on lower and middle-income workers, they are more likely to be pumped into the economy through increased consumer spending. Both of those are reasons a bipartisan task force chaired by former Sen. Pete Domenici (R., N.M.) endorsed a payroll tax holiday last month. Without Congressional action, the federal estate tax returns in 26 days. The malpractice continues. The U.S. Congress ought to be ashamed of itself. Beginning Friday, January 1, 2010, the estate tax goes away for a year. Under current laws in effect until the end of this year, the size of the exemption (or amount a person may die without owing any federal estate tax) is $3.5 million per individual or up to $7 million per couple. Going to no tax is terrible. There is an expectation that Congress will pass an estate tax next year and make it retroactive to January 1, but who knows if that will work, and as Congress has proved this year, what do expectations amount to. The malpractice continues as the estate tax returns on January 1, 2011 if inaction by Congress continues, but with a much tougher bite. Overlooked in the brawl over expiring Bush-era tax rates is what will happen to the death tax. Without action in the lame duck Congress, the estate tax will rise from the dead on January 1 with a vengeance, the rate climbing back to 55% from zero this year. Galloway pens another keeper: With Democrats in twilight, a new political game emerges, & 5 former House Democrats may provide needed ballast in ATL. Since the dust settled from last month’s elections, six state lawmakers, all white and all from rural Georgia, have thrown up their hands in despair. With the Democratic Party entering a kind of twilight existence in Georgia, the six have declared themselves Republicans. November’s Democratic deflation could tempt one to declare politics at an end in Georgia. But it is simply moving into a more subtle, intramural phase in which six virginal Republicans could play a crucial role — particularly in the House. Georgia politics has become an all-Republican matter of fiscal conservatism vs. social conservatism. With Democrats largely on the sidelines. Last month’s coup against Lt. Gov. Casey Cagle by Republican leaders of the Senate, stripping him of authority over that chamber, could be interpreted as another facet of the social-fiscal conflict. For decades, under Democratic rule, members of the state Senate patterned themselves after their Washington counterparts: They were in the deliberative chamber where hot legislation went to cool off. That has become less so since the Republican takeover. Some of the most divisive social measures of the past few years — on immigration, abortion, stem cell research, voter ID and firearm possession — have had their speedy births in the Senate. Politicians elected statewide, including the lieutenant governor, often prefer their legislation without sharp edges — and to that extent, Cagle has occasionally served as a brake. But no longer. The Republican senators now in charge hail from districts that are thoroughly populated with GOP voters. Subtlety is no longer required. That makes the House — with its labyrinth of a committee system — even more important for fiscal conservatives who want to avoid what they see as the excesses of their socially committed colleagues. “I’m a fiscal conservative,” said Hanner, a 35-year veteran of the Capitol. “I was Gerald yesterday, I’m Gerald today, and I’ll be Gerald tomorrow,” Greene said. None of the five want to step on the toes of new friends, and all declare themselves to be lifelong conservatives. But none have offered up evidence of a road-to-Damascus conversion like that experienced by Zell Miller, the former governor and U.S. senator who has became a champion of conservative social issues. In all likelihood, the five Democratic converts in the House will provide ballast for the fiscally conservative side of the Republican ledger, making it even harder for the most passionate members of the GOP base to get what they want. A 10-23-10 post was entitled "New Jersey Gov. Chris Christie has seen his star rise nationally." A little shaky, the camera shows Gov. Chris Christie of New Jersey shedding his sport coat at a town-hall-style meeting as a teacher criticizes what she sees as his attacks on her profession. He begins to respond, the woman tosses her head in frustration, and Mr. Christie goes for the jugular. The testy exchange is vintage Christie — or, at least, vintage Christie on YouTube, where it has drawn more than 770,000 views, a number that dwarfs those of his peers around the country and has fueled the buzz about his being a potential national candidate. Since Mr. Christie took office in January, his staff has spread his message on YouTube, posting sharply edited videos of him talking tough or dressing down hostile questioners, a stark contrast with the set pieces that make up most other politicians’ offerings online. YouTube, started in 2005, is seen as crucial to reaching younger people who may not pay attention to talk radio or cable news. 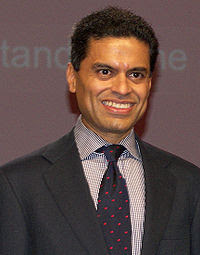 Zakaria: The problem we need to fix is simple. Americans have an appetite for government benefits that greatly exceeds their appetite for taxes. The fate of the U.S. is going to be decided over the next year. O.K., I know that's overly dramatic, but here's why I say it. The deficit-reduction commission co-chaired by Erskine Bowles and Alan Simpson has put the long-term fiscal health of the country front and center on the national stage. If we're lucky, we'll have a serious debate about it. We could decide that we are willing to undertake real reforms and fix the problem. Or we could once again kick the can down the road. If we do the latter, things get worse, the political deadlock hardens, and costs rise. Historians may well look back and say this was the point at which the U.S. began its long and seemingly irreversible decline. The problem we need to fix is simple. Americans have an appetite for government benefits that greatly exceeds their appetite for taxes. For more than a generation, we have squared this dishonest circle by borrowing vast amounts of money. As more people age, this gap between what we want the government to provide and what we are willing to pay for is going to widen to an unsustainable level. Over the next 75 years, benefits under entitlement programs will exceed government revenue by $40 trillion. The federal budget deficit, if unattended, will reach 24% of GDP in 2040 —well beyond Greek and Irish territory. At that point, the measures it would take to close the gap are so punitive — we're talking tax hikes of 70% or spending cuts of 50% — that it is inconceivable that we will make them. If by some chance we were to make them, they would put the economy in a death spiral. Yet while the problem seems insurmountable, it really is not — at least not at this point. The greatest service the co-chairs of the deficit-reduction commission have done in their draft proposal is to make that plain. The right, for its part, continues to live in an alternative universe where there will be no need for more revenue, just cuts in spending — though of course it makes no serious effort to describe which programs will be cut. In fact, no matter how many programs you cut, you will need more tax revenue. My preference would be for a national sales tax or value-added tax. Either of those would be a highly efficient way to raise revenue because there is almost no possibility of cheating. Moreover, such taxes have the effect of encouraging savings and discouraging consumption. The crucial arena is not the economic realm but the political one. Will moderates and centrists — who make up the majority in the U.S. — come together and fight for a compromise that embraces ideas from both sides? Or will this conversation turn into the usual demagoguery, with each side tearing apart the things they dislike and ensuring that the deficit commission becomes one more sad story about Washington's inability to grapple with our long-term problems? We've seen the political process break down and avoid dealing with immigration reform, energy policy and Social Security. Will we fail again, this time on the biggest test? Projects Test Resolve on Earmarks - One man's pork is another man's bacon. 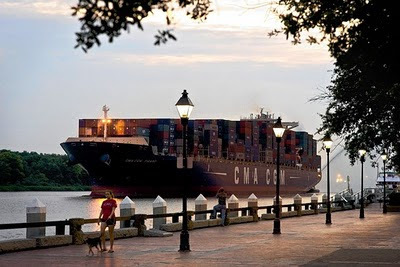 A container ship heads upriver to the Port of Savannah, which is seeking $105 million in federal funds to begin deepening its harbor. Congressional Republicans are eagerly promoting their promise to abstain from earmarks, saying the move is necessary to contain federal spending and mollify voters angry at Washington. But the pledge made on the campaign trail is proving more complicated in practice. Some senators' resolve is being tested as two of the nation's major ports, one [in Savannaha, Ga.] and another in Charleston, S.C., urgently seek funding to expand. Port officials say federal dollars will be crucial next year so they can deepen their harbors to accommodate bigger ships after the Panama Canal is widened and reopens in 2014. It isn't clear that can be done without earmarking—special funding that lawmakers request for projects in their home states. The Savannah port is seeking $105 million for the upcoming fiscal year to begin dredging the port, while Charleston wants $400,000 for a feasibility study for its own deepening project. If the ports cannot receive the mega-ships, Savannah and Charleston officials say, the cargo will go to New York or Norfolk, Va., which they argue would be inefficient and deliver an economic blow to the Southeast, costing jobs. Earmarks were denounced by conservative activists during the recent midterm election campaigns, and Republicans in both chambers banned them last month. But several GOP senators have suggested they'll make exceptions if they see fit, including three of the four from Georgia and South Carolina. Spending on items such as ports, bridges and roads are included in the president's annual budget, which is then reviewed by congressional committees. It's at that point that lawmakers often go to a committee chairman to get their earmarked projects inserted. Individual projects could also be funded in free-standing bills, but that would be impractical, given how numerous such projects are. The controversial nature of earmarks was highlighted Tuesday when the Senate voted 56-39 against expanding an earmark ban to the full chamber that was similar to the one adopted by Senate Republicans at a closed-door meeting Nov. 16. Sen. Lindsey Graham (R., S.C.) supports the earmark ban but has vowed to earmark funds for the Charleston port if necessary. "I'm in a spot where I have to get the port deepened for economic reasons," he said. Democrats from the region say the ban never made any sense. "Charleston is going to be dead in the water because of this short-sighted myopic view that seems to be controlling," said Rep. James Clyburn (D., S.C.). Savannah, the second-busiest port on the East Coast after the Port of New York/New Jersey, has been pressing an application with the U.S. Army Corps of Engineers since 1999 to dredge the Savannah River from its current 42-feet depth at low tide to 48 feet. This month, the Corps recommended dredging to 47 feet. The cost has been estimated at about $600 million—$400 million of which would be sought in federal funds. Anxious port officials have recruited Kasim Reed, the Democratic mayor of Atlanta and an ally of President Barack Obama, to push the administration for funding. Some Republicans had been concerned that their earmark ban would lead to a transfer of power over budgeting decisions to the president. Curtis Foltz, executive director of the Georgia Ports Authority, said in an interview that he and other officials had visited Washington repeatedly to lobby the White House and the state's congressional delegation. Having no port for large ships in the Southeast would increase the cost of transporting imported and exported goods from one of the fastest-growing parts of the nation, he said. "This is not infrastructure for a water park or a bicycle path," Mr. Foltz said. "This is infrastructure that is absolutely necessary for the nation." Georgia's Republican senators are touting their opposition to earmarks but also suggesting they'll do whatever it takes for the port. "My position has consistently been, I'm going to support reform or total elimination of earmarks," said Sen. Saxby Chambliss (R., Ga.). "But if a project is vital to the economy and jobs of my state, I'm sent here by the people of my state to make sure their interests are looked after." Sen. Johnny Isakson (R., Ga.), who also supported the ban, said he would "continue to fight for funding for projects such as the expansion of the Savannah port that is critical to my state and to U.S. trade." Many senators are allowing themselves such wiggle room. Other Republicans oppose the ban outright and are not committed to abstaining from earmarks at all. Democrats, who have a majority in the Senate, have not adopted a ban. In the House, the earmark ban may be more effective, since Republicans will control that chamber and say they won't advance any bill that includes such projects. The Charleston port, like its counterpart in Savannah, is a major driver of its state's economy. Charleston officials are planning a new terminal by 2016 that will boost the port's container capacity by 50%. They also want to deepen the port—the East Coast's fourth-largest—by five feet to 50 feet. Sen. Jim DeMint (R., S.C.), one of the Senate's foremost earmark opponents and the force behind the ban, does not intend to make an exception for Charleston, a stance that has attracted praise from fiscal conservatives but some heat at home. Mr. DeMint said he strongly supported the port, but that the earmark system had not helped it. Port projects are handled by the Army Corps, whose budget is largely driven by earmarks. Mr. DeMint has proposed a merit-based system under which a commission would determine which Corps projects receive priority.